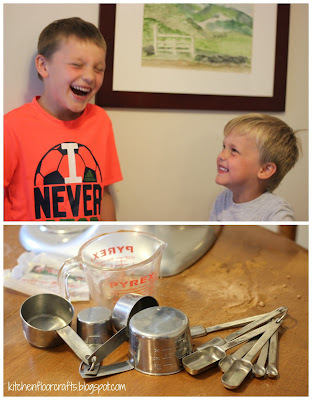 It's been a while since we shared one of our Kids Cook posts, although the boys still enjoy helping me cook and bake on a regular basis. 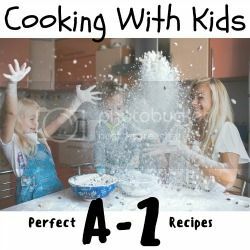 That's why we're excited to participate in the Summer 2016 A-Z Cooking with Kids Blog Hop hosted by 3 Princess and 1 Dude. Almost 20 bloggers have come together to share different recipes that kids can either create on their own or create with a bit of grown up help. In fact - there 26 recipes kids can create- one for each letter of the alphabet! We had the letter J - which instantly made me think of JAM. And as we love cookies we decided to try our hand at Jam Thumbprint Cookies. See the notes below photos for tips on cooking with kids. 2. 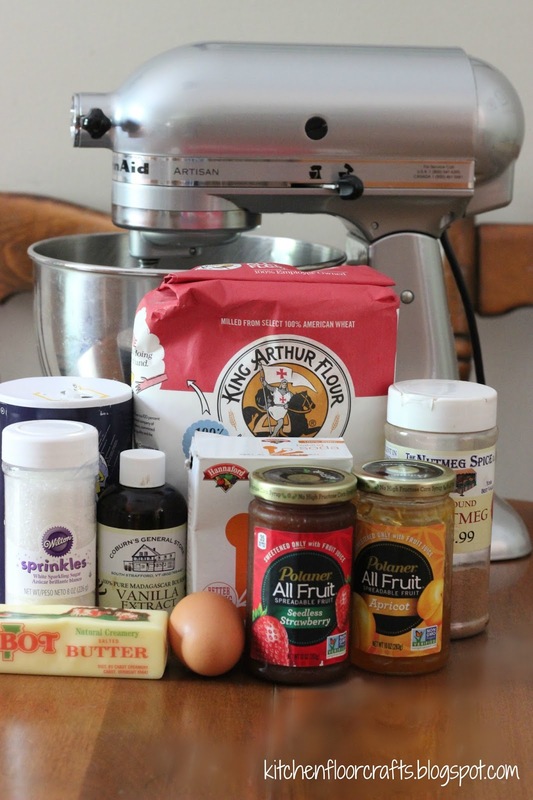 In a large mixing bowl beat the butter and sugar until creamed. 3. Add the baking soda and salt, mix until combined. 4. Add in the egg, vanilla, and nutmeg until fully mixed. 5. Mix in the flour with the mixer, if the dough becomes too stiff then turn off the mixer and mix by hand with a wooden spoon. 6. Place the bowl and the dough into the refrigerator to chill for an hour. Cooking with kids notes - Recently I started to put the mixer onto the table instead of the counter, which allows both kiddos easier access. I always try to give each kid a turn with something when we cook. The more we bake, the more they each find something they like to do best. 7. After the dough has chilled, remove it from the refrigerator. 8. Pour the coarse sugar into a shallow bowl/plate. 9. Shape the dough into one inch balls and then roll the balls in the coarse sugar until coated. 10. Place the balls onto a lined cookie sheet. 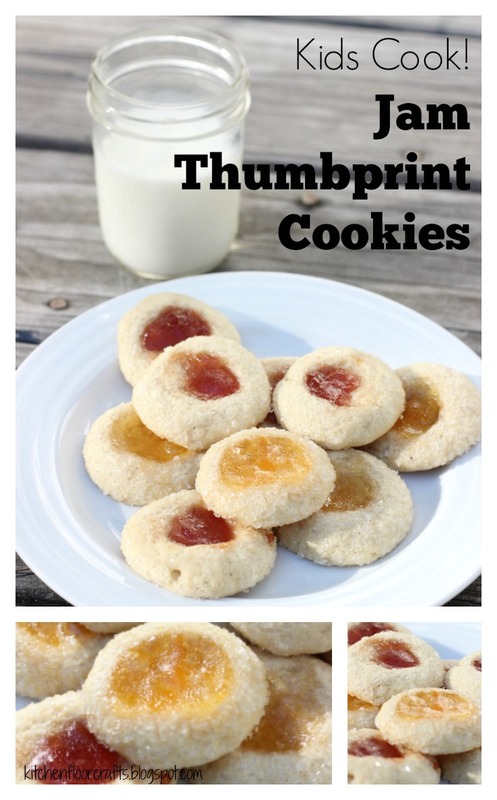 Using a thumb, press a small indent into the center of the cookie. 11. 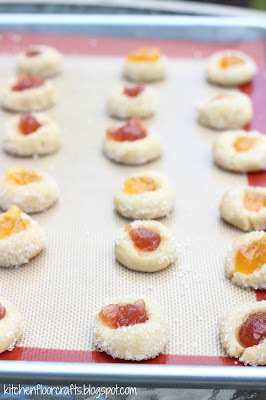 Use a small spoon to put about a teaspoon of jam into the center of each cookie. 12. 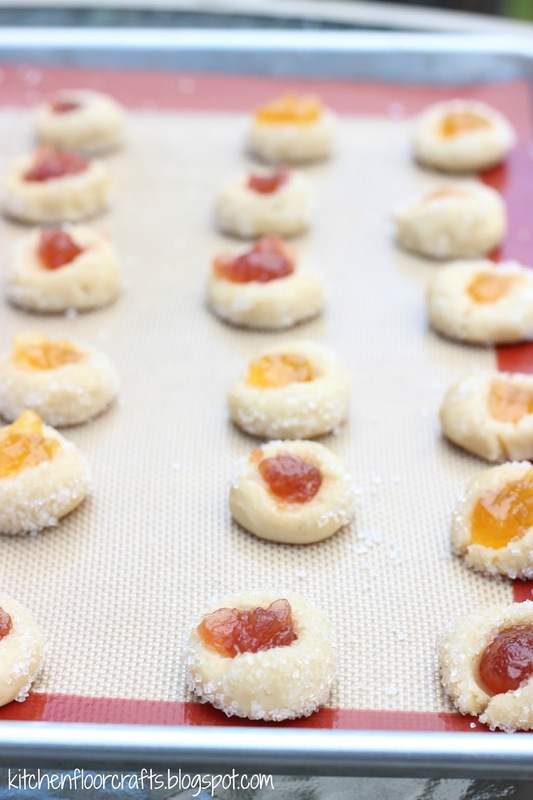 Bake to cookies for about 10 minutes, or until lightly golden around the edges. Cool on the tray for a few minutes and then transfer to a cooling rack. 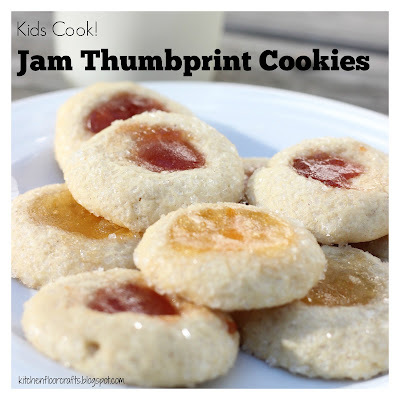 Cooking with kids notes- The hands on elements of these cookies make them perfect for baking with kids! 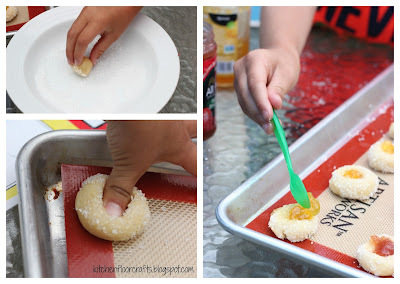 Kids love rolling the cookies into balls, then rolling them in the sugar, and of course, indenting them in with their thumb. Of course, some of them get a little too smooshed . . . but if it's really bad enough you can always roll them again. My boys also loved using the little spoons (we used baby spoons) to add in the jam. Of course, cooking with kids always comes with it's own joys and challenges - both the fun and the mess. But hopefully, the fun out weighs the mess. Even better than the fun of baking the cookies - the taste of the cookies! This batch disappeared very quickly! Are you a blogger? 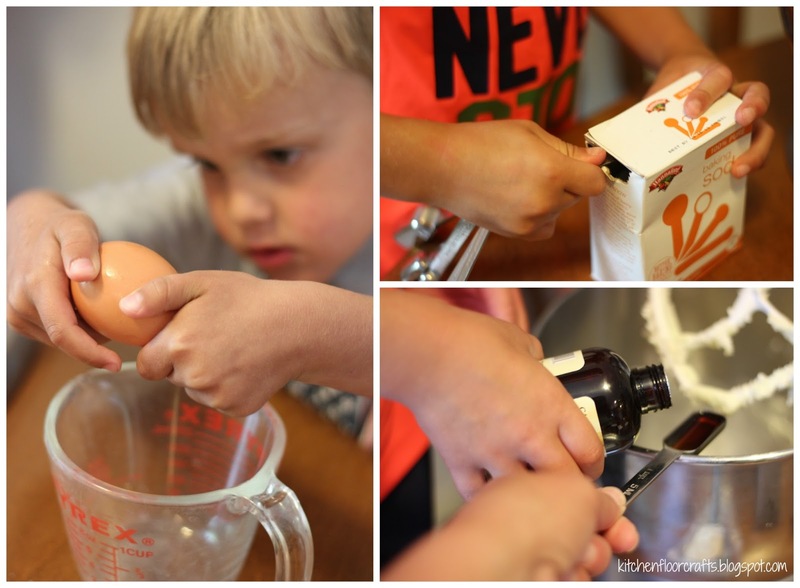 We'd love for you to link up your cooking with kids recipe posts below. All relevant posts will be added to a special Pinterest board. Labels: cookies, cooking with kids, Kids Cook!